Sam Bailey was Lancaster City's star performer at Matlock. 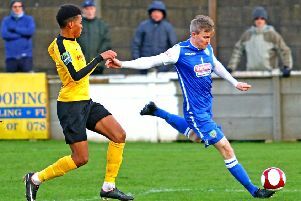 Lancaster City suffered late despair as they fell to an injury-time free-kick at Matlock Town having clawed back a two-goal deficit in the second half. Phil Brown opted for two up front and the visitors tried to play football from the get go, however they fell behind early on as Matlock keeper Phil Barnes’ clearance was misjudged by Ben Hudson allowing Lee Bennett to lob over the advancing Josh Powell. Shaun Harrad was then denied by Powell with a header but not long after was the beneficiary of more suspect Lancaster defending, being allowed the space to loop a header into the far corner from a deep free-kick. City got themselves back into the game 10 minutes before the break largely thanks to Sam Bailey. Simon Wills rolled to Bailey on the inside left, a sublime touch between two opponents set him up for a long-range effort which cannoned off Tom Kilifin to bamboozle Barnes and land in the net via a post. The Dolly Blues came out for the second period all guns blazing and only ever looked vulnerable when Matlock broke. Billy Akrigg was unlucky not to equalise forcing a good save from Barnes and Kilifin will know he should have done better having intercepted a headed backpass before firing wide. Ryan Winder was then slipped in down the right-hand side but Barnes stood firm to his drilled effort. Powell was forced into no-man’s land to try and clear leaving an open goal for Bennett but his tame effort was dribbled off the line by Hudson. Kilifin and Akrigg exchanged passes but the former could only rifle into the side netting, prior to Bennett feeding Harrad who was denied by Powell similarly to Barnes’ save from Winder at the other end. It looked like game over in the 80th minute as Harrad doubled his tally, sliding under Powell after being put through by Bennett as Lancaster pressed. It took less than two minutes for City to respond however with the best move of the game. Bailey played a one-two with Akrigg and swung a great ball across the face of goal for substitute Paul Jarvis to volley home. Bailey then had a shot deflected wide before his corner was flicked on at the near post and scrambled just over the line by another replacement Craig Carney as Lancaster levelled things up. The visitors now looked by far the most likely to take all three points and could have had a decent chance as Wills was felled on the edge of the Matlock area, but referee Bradley Hall gave nothing. As it happened, Matlock countered and won a free-kick on the inside right, which teenage debutant Harry Vince wonderfully dipped into the top corner. A tough one for Brown and his men to stomach as they head into a week that involves a Tuesday night trip to Rushall before hosting high-fliers Grantham Town. Lancaster City: Powell, Henry, Dugdale, Wills, Steel, Hudson, Winder (Jarvis), Akrigg (Carney), Djabi (Tam), Kilifin, S Bailey. Star Man: Sam Bailey - Heavily involved in all three of Lancaster’s goals.